Tatamagouche is a village in Colchester County, Nova Scotia, Canada.Tatamagouche is situated on the Northumberland Strait 50 kilometres north of Truro and 50 kilometres west of Pictou. Explore Tatamagouche's surroundings by going to Truro (Victoria Park, Pearl & Daisy Natural Soap Company, & more), Masstown Market (in Masstown) and Maitland (Inklings in Wood & River Rafting & Tubing). There's still lots to do: learn about winemaking at Jost Vineyards, tour the pleasant surroundings at Nelson Memorial Park, get outside with Fundy Tidal Bore Adventures, and examine the collection at Northumberland Fisheries Museum. To see other places to visit, traveler tips, photos, and more tourist information, refer to the Tatamagouche tour planner. Gander to Tatamagouche is an approximately 5.5-hour flight. You can also drive. In November in Tatamagouche, expect temperatures between 7°C during the day and -2°C at night. Finish your sightseeing early on the 20th (Tue) to allow enough time to travel to Grand Pre. Grand-Pré is a Canadian rural community in Kings County, Nova Scotia. 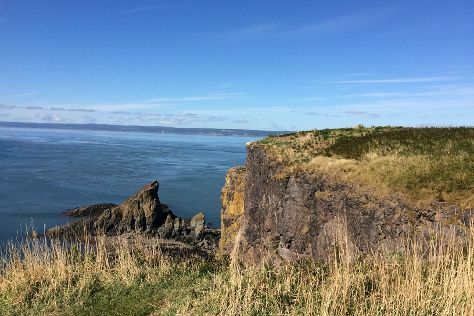 You'll find plenty of places to visit near Grand Pre: Joggins Fossil Cliffs Centre (in Joggins), Berwick Heights Golf Course (in Berwick) and Kentville (Cape Split Trailhead & Ocean Zn Giftshop & Decor). Next up on the itinerary: contemplate the long history of Grand Pre National Historic Site, examine the collection at Charles MacDonald Concrete House Museum, stroll through Coldbrook Provincial Park, and learn about all things military at Churchill House & Marine Memorial Room. To see reviews, more things to do, traveler tips, and more tourist information, refer to the Grand Pre trip itinerary maker app . You can drive from Tatamagouche to Grand Pre in 2.5 hours. In November in Grand Pre, expect temperatures between 9°C during the day and 0°C at night. Finish your sightseeing early on the 26th (Mon) to allow enough time to travel to Annapolis Royal. Annapolis Royal, formerly known as Annapolis, is a town located in the western part of Annapolis County, Nova Scotia, Canada.Today's Annapolis Royal evolved from the 1605 French settlement of Port Royal (briefly Charlesfort), renamed in honour of Queen Anne following the Siege of Port Royal in 1710 by Britain. Change things up with these side-trips from Annapolis Royal: Middleton (Memory Lane Railway Museum & Annapolis Valley Macdonald Museum), Digby (Crooked Timber Books, Prim Point Lighthouse, & more) and Kingston (Paragon Golf & Country Club, Stronach Park, & more). There's still lots to do: take in nature's colorful creations at Annapolis Royal Historic Gardens, relax in the rural setting at Nova Scotia Blueberries Halliday Farms, contemplate the long history of Fort Anne National Historic Site, and stop by Lucky Rabbit Pottery. To see reviews, ratings, other places to visit, and tourist information, read Annapolis Royal trip planner. Traveling by car from Grand Pre to Annapolis Royal takes 1.5 hours. In November, daytime highs in Annapolis Royal are 9°C, while nighttime lows are 0°C. Wrap up your sightseeing on the 3rd (Mon) early enough to travel to Mavillette. Get out of town with these interesting Mavillette side-trips: Musee des Acadiens des Pubnicos & Research Center (in Pubnico), Le Village Historique Acadien de la Nouvelle-Ecosse (in Lower West Pubnico) and Yarmouth (Pelton-Fuller House, Yarmouth Links, & more). To plan Mavillette vacation without wasting time, ask Inspirock to design an itinerary. Getting from Annapolis Royal to Mavillette by car takes about 1.5 hours. Plan for a bit warmer nights when traveling from Annapolis Royal in December since evenings lows in Mavillette dip to -1°C. Finish your sightseeing early on the 9th (Sun) so you can travel to Lunenburg. You'll find plenty of places to visit near Lunenburg: Beach Meadows Beach Park (in Brooklyn), Bayswater Beach Provincial Park (in Bayswater) and Graves Island Provincial Park (in Chester). There's still lots to do: pause for some serene contemplation at St. John's Anglican Church, stop by Have A Yarn, see the interesting displays at Hooked Rug Museum of North America, and stroll through Rissers Beach Provincial Park. To see more things to do, ratings, where to stay, and other tourist information, read our Lunenburg day trip site . You can drive from Mavillette to Lunenburg in 3 hours. In December in Lunenburg, expect temperatures between 5°C during the day and -1°C at night. Finish your sightseeing early on the 16th (Sun) to allow enough time to drive to Halifax. 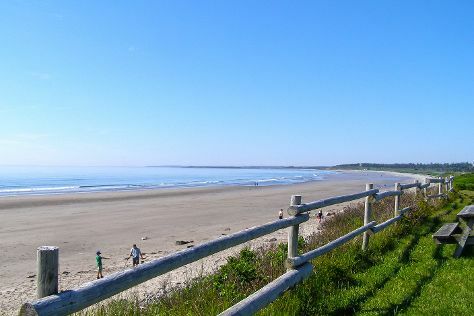 Get out of town with these interesting Halifax side-trips: Lawrencetown Beach (in East Lawrencetown) and Peggy's Cove (William deGarthe Art Gallery, Peggy's Cove Lighthouse, & more). The adventure continues: take in nature's colorful creations at Halifax Public Gardens, take in the waterfront at Halifax Waterfront Boardwalk, get great views at Halifax Citadel National Historic Site of Canada, and take in the spiritual surroundings of St. Paul's Church. To see other places to visit, photos, where to stay, and tourist information, you can read our Halifax trip itinerary builder site . Getting from Lunenburg to Halifax by car takes about 1.5 hours. Other options: do a combination of taxi and bus. Traveling from Lunenburg in December, expect little chillier with lows of -5°C in Halifax. Wrap up your sightseeing on the 22nd (Sat) early enough to travel to Louisbourg. Louisbourg is an unincorporated community and former town located in Nova Scotia's Cape Breton Regional Municipality.HistoryThe French military founded the Fortress of Louisbourg in 1713 and its fortified seaport on the southwest part of the harbour, naming it in honour of Louis XIV. Explore Louisbourg's surroundings by going to Two Rivers Wildlife Park (in Huntingtion), Sydney (Cossit House Museum, Centre 200, & more) and Dominion Beach Provincial Park (in Dominion). And it doesn't end there: contemplate the long history of Fortress of Louisbourg National Historic Site, examine the collection at Sydney and Louisbourg Railway Museum, hike along Louisbourg Lighthouse Coastal Trail, and enjoy the sea views from Louisbourg Lighthouse. To find ratings, photos, reviews, and more tourist information, use the Louisbourg travel route website . You can do a combination of flight and taxi from Halifax to Louisbourg in 3.5 hours. Other options are to drive; or do a combination of bus and taxi. In December, daytime highs in Louisbourg are 2°C, while nighttime lows are -5°C. Cap off your sightseeing on the 29th (Sat) early enough to go by car to Baddeck. Explore Baddeck's surroundings by going to Glenora Inn and Distillery (in Mabou), Inverness (Inverness Beach Boardwalk & Cabot Links Golf Course) and Margaree Salmon Museum (in Margaree Valley). 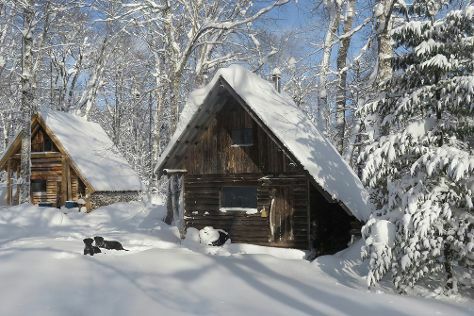 There's much more to do: take an in-depth tour of Alexander Graham Bell National Historic Site, play a few rounds at The Lakes Golf Club, fly down the slopes at Ski Tuonela, and steep yourself in history at Highland Village. Discover how to plan a Baddeck trip in just a few steps with Inspirock's itinerary builder. Drive from Louisbourg to Baddeck in 1.5 hours. Alternatively, you can do a combination of taxi and bus. Traveling from Louisbourg in December, expect nights in Baddeck to be about the same, around -7°C, while days are a bit cooler, around 0°C. Finish your sightseeing early on the 5th (Sat) to allow enough time to drive to Ingonish. Get out of town with these interesting Ingonish side-trips: St. Paul South West Lighthouse (in Dingwall), Lone Shieling (in Pleasant Bay) and Cheticamp (Le Portage Golf Club & Saint Peter's Church). Spend the 6th (Sun) exploring nature at Cape Breton Highlands National Park. 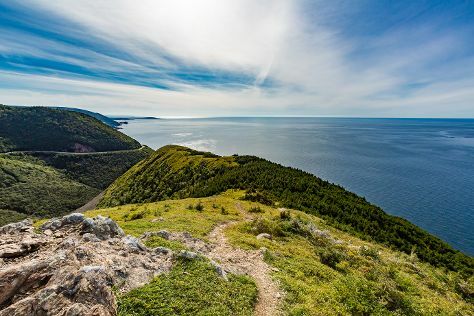 There's lots more to do: take a memorable drive along Cabot Trail, make a trip to Christopher Gorey Gallery, stroll through Black Brook Beach, and take in the awesome beauty at Franey Mountain. To find ratings, traveler tips, other places to visit, and tourist information, you can read our Ingonish tour planning app . You can drive from Baddeck to Ingonish in 1.5 hours. In January, daily temperatures in Ingonish can reach 0°C, while at night they dip to -9°C. You will leave for home on the 13th (Sun).